We stumbled upon Owariya while we were craft shopping in Kyoto. It was such a lucky find! 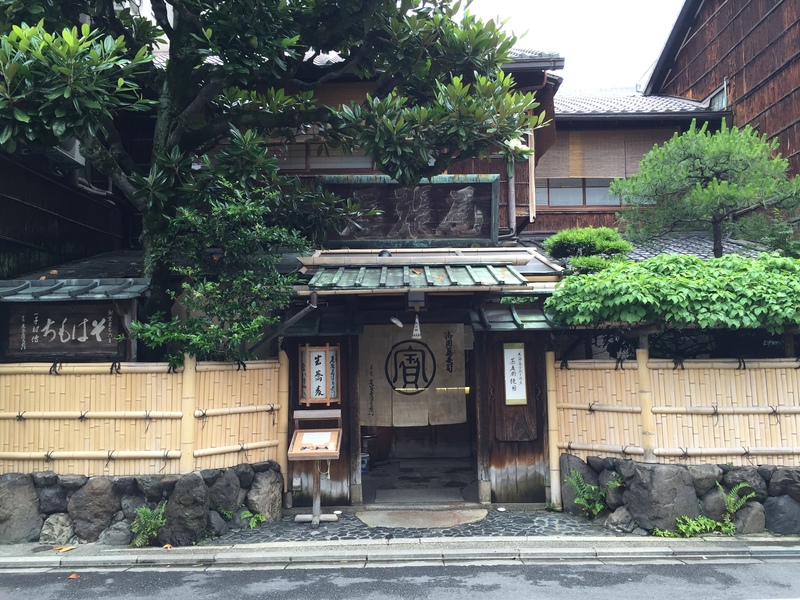 Owariya has been around since 1465 when it opened as a confectionary shop in Kyoto. There are a few shops around town, but we went to the honten, the original shop. Downstairs, there’s a counter where they still sell their sweets and upstairs there are several simple dining rooms. 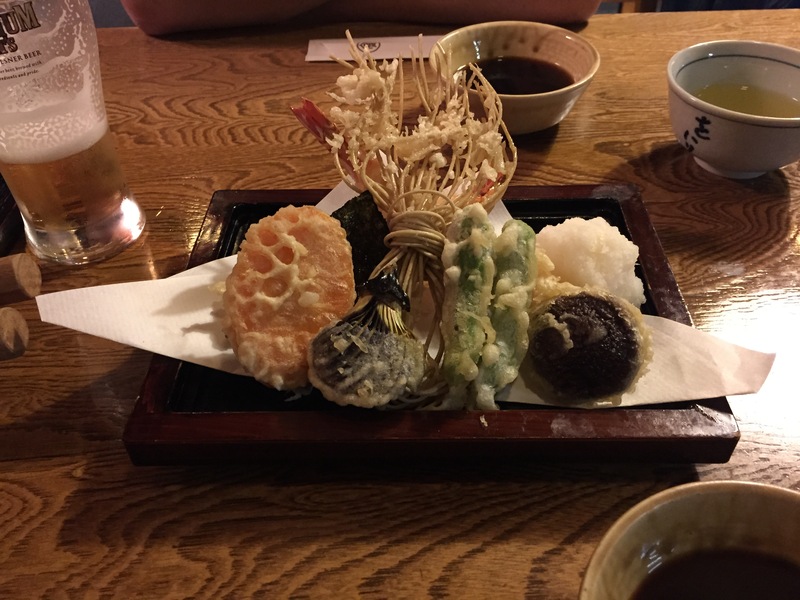 We started our meal with a beautiful tempura appetizer. I ordered the Seiro Regular, a simple cold buckwheat noodle dish. It came with a tray of noodles, broth, thinly sliced leeks, and wasabi. I mixed the broth, scallions, and wasabi in the bowl and then dipped the noodles. It was simple and perfectly refreshing on a warm day. So delicious! 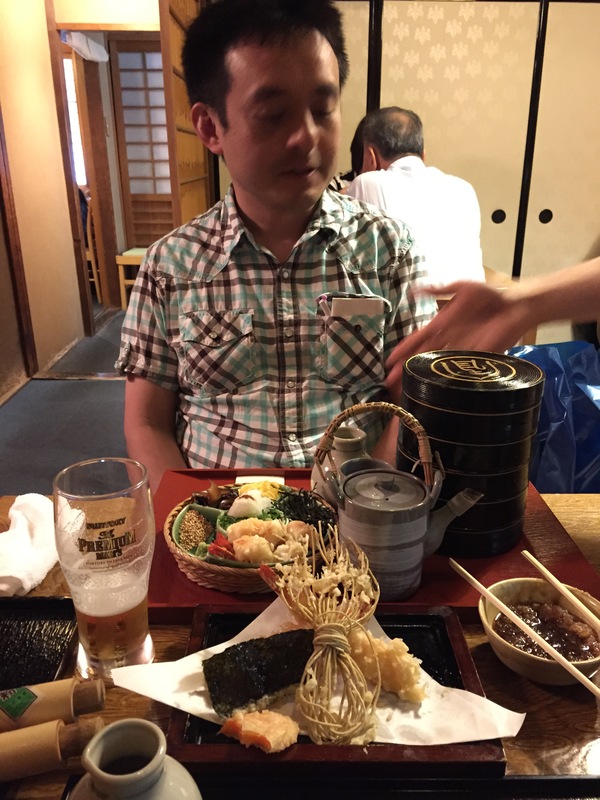 Naoto ordered the Hourai Soba, a deluxe cold noodle dish. There was a stacking container of five levels of noodles, broth, and a tray of toppings: tempura shrimp, shiitake mushrooms, omelet, seaweed, sesame seeds, wasabi, daikon, and leeks. As he ate each tray of noodles, he added whichever toppings he wanted, so each level was like eating a slightly different dish. (The top picture shows our server explaining about each ingredient.) It was really fun to watch but it seemed like so much food, especially for Japan! And his meal came with a pot of tea made with the water they used to cook the buckwheat noodles–nothing goes to waste in the restaurant! At the end of our meal, they brought out a tray of desserts. 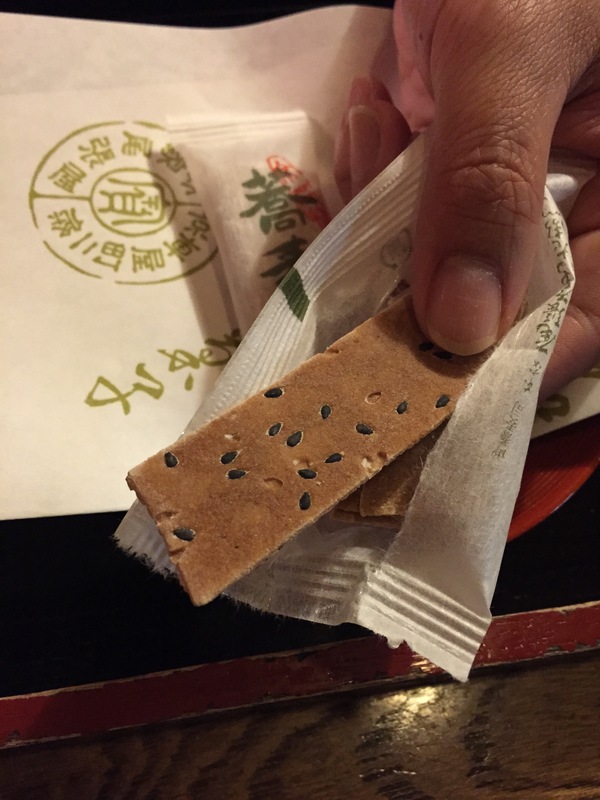 All of the desserts in Owariya are made with buckwheat flour. I wasn’t expecting to like them as much as I did. 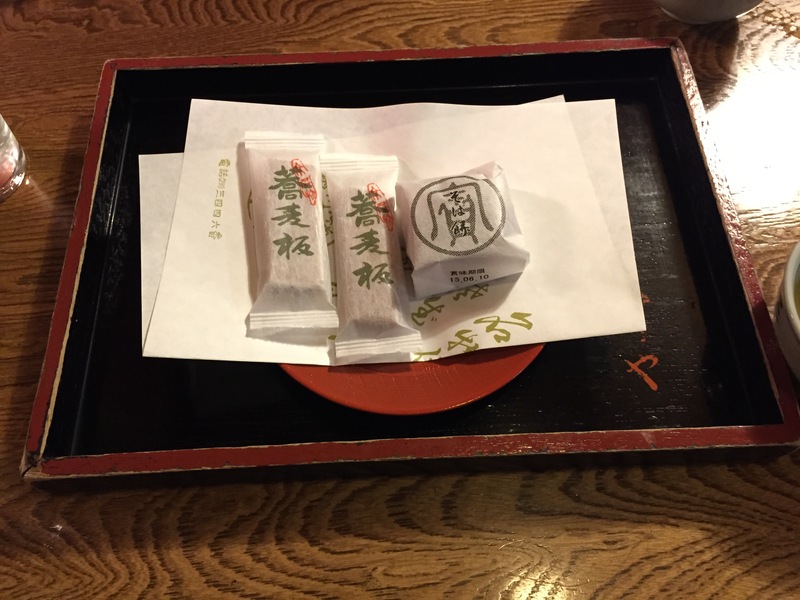 The first thing we tried was the soba rice cake. It was light and had a lightly sweet flavor. 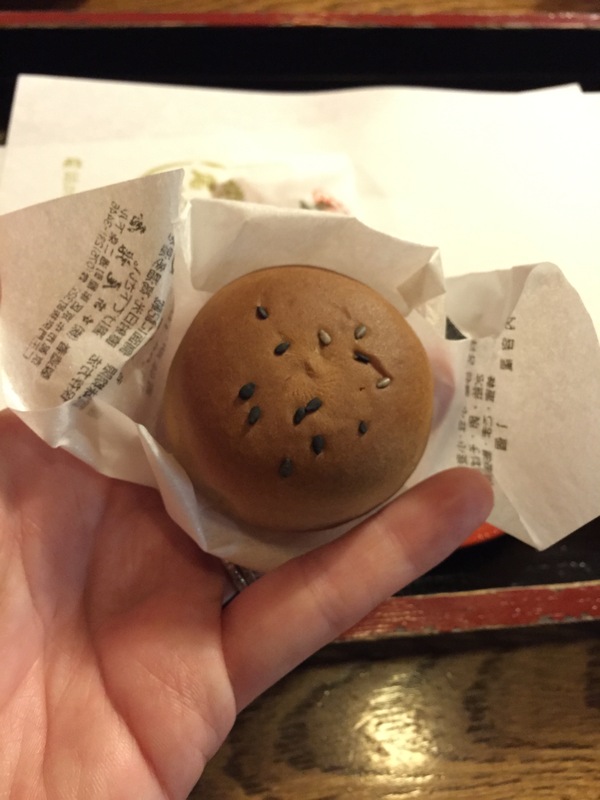 Inside was red bean paste. Then we had Soba-Ita. They were about the size of a stick of gum with a nice, crunchy texture and a great toasty flavor. I liked these so much that we bought two boxes to bring home! 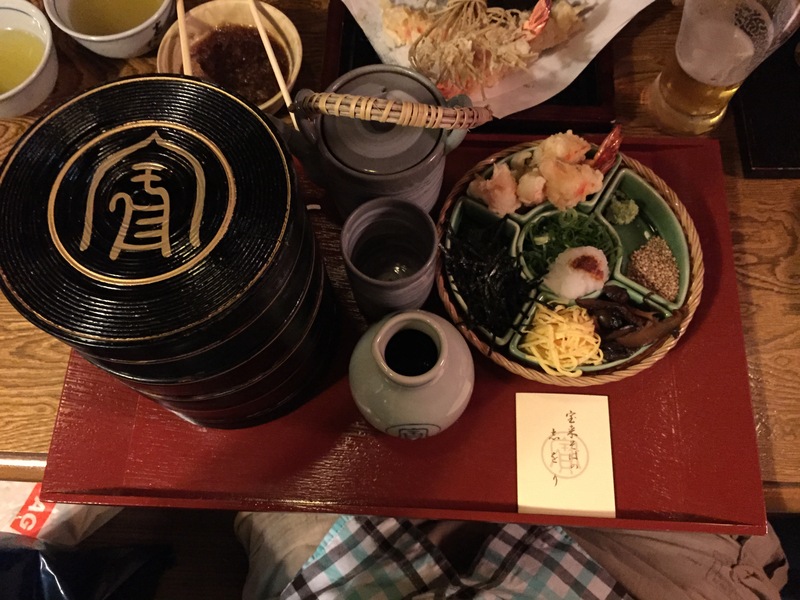 I know I say this about all of my meals in Japan, but this really was one of the best. 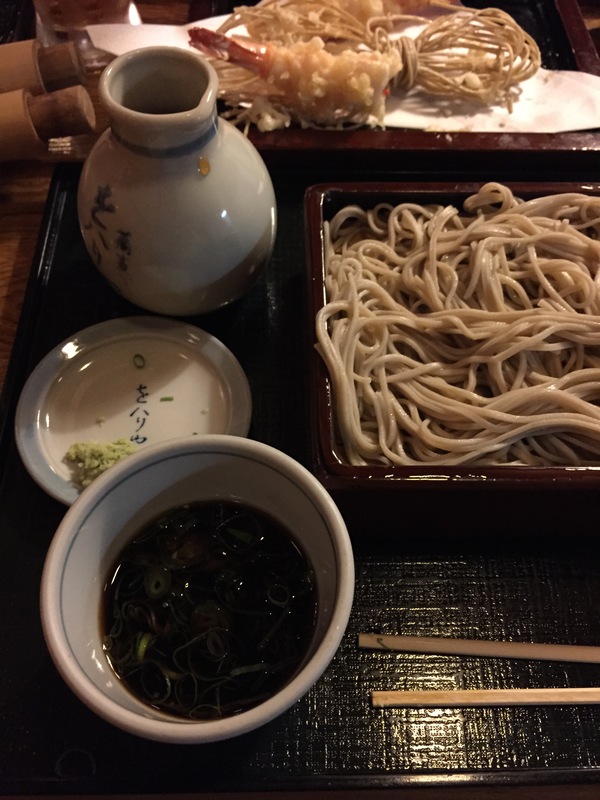 I guess when you eat at a restaurant that’s been perfecting their soba for 550 years, you know it’s going to be good! Definitely the highlight of our time in Kyoto! I have to say, it ranks higher than that coffee shop we went to!